Anderson, M. - The World Encyclopedia of Cacti & Succulents Boeken en Tijdschriften over Cactussen, Vetplanten, Succulenten, Mescaline Cactussen. 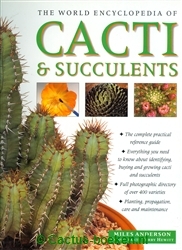 Miles Anderson - The World Encyclopedia of Cacti & Succulents (voorkant). Miles Anderson - The World Encyclopedia of Cacti & Succulents (achterkant). 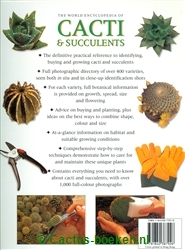 Titel: The World Encyclopedia of Cacti & Succulents. Jaar van eerste uitgifte: 1998.